Need hearing protection to use at the job site, to block out your noisy roommates or for the metal concert you plan on attending? We have Disposable, Noise-reducing ear plugs! 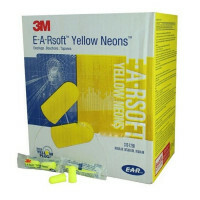 Corded and Uncorded Disposable Ear plugs for hearing safety. Our earbuds have self adjusting foam that are made to fit most ear canals for long term comfort without irritating them. With a noise reduction rate 31db, you can be assured that your ears will be protected from excessive and prolonged noise that can cause permanent hearing loss. Corded and Uncorded Disposable Hearing Protection - Maximum hearing protection with max comfort! Need disposable Corded / Uncorded Ear Plugs and Hearing Protection to guard against long-term hearing loss? First-Aid-Product.com has it all right here! Wholesale to the Public Manufacturer Direct Safety Product Sales since 1993.